Making measurements with a microscope can be performed using an eyepiece reticle. 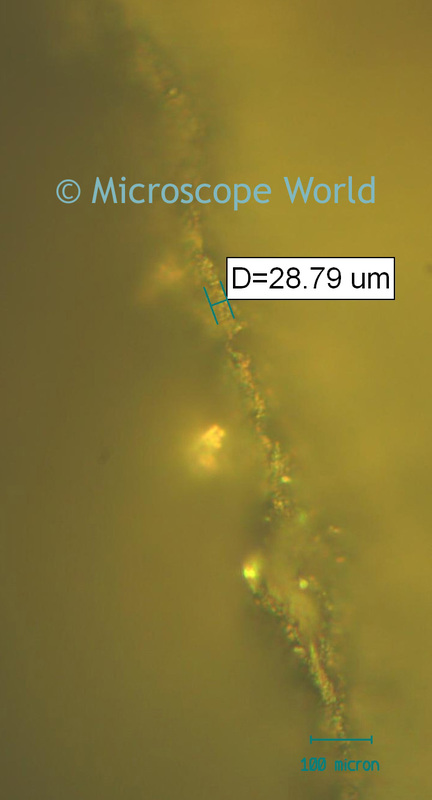 Another way to perform measurements is by using the software that is included with a microscope camera. 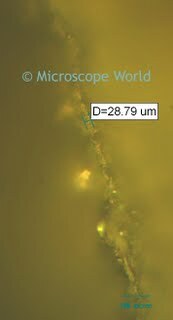 The image below was captured with the Lumenera Infinity 1-3 DK3000 3.1 mega pixel digital microscope camera, using the measuring software. The software was calibrated with the microscope and then measurements were made by using the computer. Image captured at 1000x magnification using a metallurgical microscope. When using the software to make measurements, the accuracy of the measurement is dependent on the ability to find the edges of what you are measuring. Measurements are made by drawing a line on the image. You can also draw a circle to determine the diameter or radius of the circle, or polygon images.